Machu Picchu is located at an altitude of 2,430 m (7,972 feet) above sea level. In front of her rises Huayna Picchu, which gives classical geography to the archaeological site, its peak reaches 2.720 meters above sea level. At this point, no matter how physically fit you have, you may experience symptoms of altitude sickness. Acute mountain sickness (AMS), this disease usually can be given typically when a height of 2,500 meters above sea level is exceeded, especially if you come from low-lying places, if we talk in terms of risk, only the tops of the mountains Machu Picchu and Huayna Picchu would be where you would really prone to acquire such evil. However, despite the situation, they are statistically very few visitors to the Historic Sanctuary of Machu Picchu, who come to suffer this disease. Therefore, travelers should be cautious on arrival in Cusco, the gateway to Machu Picchu. The imperial city of Cusco has an altitude of 3,399 meters, higher than Machu Picchu significantly. Upon arrival to Cusco, especially if it has flown directly from Lima (sea level), in a rapid ascent of 1 hour trip, you should take the recommendations to acclimatize. Newcomers often want to go from Cusco to the peoples of the Sacred Valley. These cities are slightly lower altitudes, so offer a more gentle acclimatization before returning to Cusco. Once acclimated in Cusco or the Sacred Valley, you should not have problems with altitude of Machu Picchu. You can still feel breathless in his tour of the site, but the risk of altitude sickness will be reduced. Can I see the sunrise in Machu Picchu? If you’re lucky, you can see the sunrise in the morning through Machu Picchu. When the sun pours its first rays over the beautiful landscape of the sacred city of the Incas, revealing everything in its path. To witness this beautiful spectacle, you must have entered Machu Picchu on the Inca Trail or spending the night in Aguas Calientes and get up early enough, however, at that time the cold is relentless, you are advised to dress warmly it is an effort that will definitely pay off. Many people talk about seeing the sunrise over Machu Picchu. That certainly makes sense; the idea of seeing the Inca City appear between the morning mist, is certainly attractive. However, you may need a little luck to see the sun clearly over Machu Picchu, especially during the rainy season. What time is sunrise in Machu Picchu? Although Machu Picchu, sometimes usually dawn with fog and clouds, especially in the rainy season, everything becomes clear when the sun rises over it. Unless you are walking to Machu Picchu, your income will be from the town of Aguas Calientes (Machu Picchu Pueblo). The first buses amount to Machu Picchu at 05:30 hours. The actual dawn, meanwhile, occurs approximately at 05:10 pm around November and 06:15 hours at the latest around July. Machu Picchu, meanwhile, opens to the public at 06:00 hours. In other words, there is a good chance that the morning light will have reached Machu Picchu before being there – it may even be that the sun’s rays do not show up directly, it is still a breathtaking spectacle. Even if the sun rises locally at 6 am, has yet to rise above the peaks of the mountains surrounding Machu Picchu, before you can feel its rays directly on the archaeological site, the cloudy sky can be disappointing in Machu Picchu, in any case will depend largely on luck. If your arrival to the City of Machu Picchu is with the thick morning mist, it happens that the site it see obscured. The light changes during this period, you throw on some impressive shadows across the room and through the mountains. And see Machu Picchu appear, as the mist clears, usually a rather dramatic but very beautiful show, so it’s still a good time to be there. If your income to the city of Machu Picchu via the Inca Trail, usually on the last day of hiking. 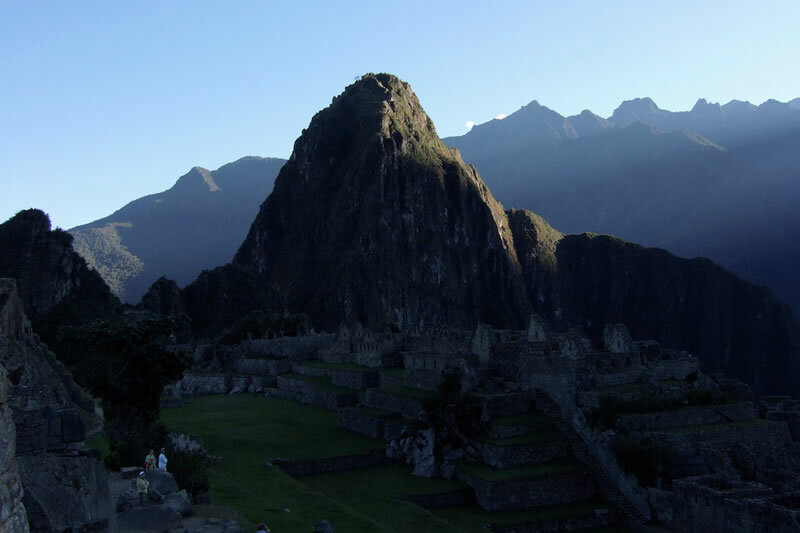 You will get up very early and will soon be in the City of Machu Picchu, before the hordes of tourists arrive to it. In theory you will see the site without discomfort. The view can certainly be spectacular from the Puerta del Sol, however, as in previous case, will have to be very lucky as they also depend on the weather and the season when visiting the Historic Sanctuary of Machu Picchu.